Wishing those of the Jewish faith a blessed and happy Hanukkah during this season of light. I really love this ancient ritual of lighting the menorah. For those unfamiliar with the symbolism of this sacred time: Hanukkah is a celebration of the victory of the Maccabean Rebellion (167-160 BCE) against the attempt by Antiochus to force Hellenistic i.e. Greek pagan, practices upon the Jewish people and symbolizes the re-dedication of the Temple. According to the legend, when the Jews regained access to the Temple, they found only one jar of oil left, enough to stay alight for only one day, but by a miracle, the oil stayed burning for eight days. Occurring around winter solstice, each night for eight nights, another candle is lit on the menorah. The amount of light gradually increases like the lengthening of sunlight. From my current exhibit, in the event that you are unable to view the works in person. See previous post for more info. Blessings and peace on this second day of Autumn. Over the last eight years my work has evolved to reflect my deepening contemplative experience of the world around me. During the days following the events of 9/11, I felt a profound sense of oneness with all beings and had a vision after the Day of Remembrance that became the painting shown here, 911: love is the answer. A year later, during a training with Buddhist and environmentalist Joanna Macy, I had a mystical experience that was a spiritual homecoming to my interconnectedness in the web of life. 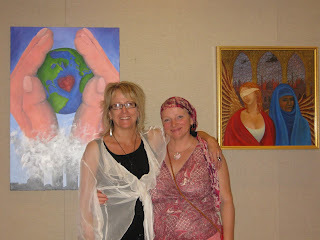 These encounters with the numinous are at the heart of my work and these paintings. My intention is to create a visual scripture that communicates our innate interdependence in the web of creation regardless of our religious or spiritual path. My recent graduate studies in the spiritual traditions of the world have given me a broader understanding of the shared symbolism that weaves itself throughout the sacred texts of our religious traditions, along with those of earth-honoring traditions. Drawing from a vast reservoir of sacred literature, I create a symbolic language that is both personal and universal to inform the narrative of my paintings. The mandala, which I began working with in 2003, has long been a vehicle for contemplation and healing in many Eastern and indigenous traditions as well in the Christian tradition, most notably by the 12th c. Abbess Hildegard von Bingen. 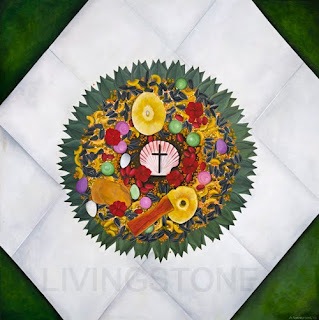 The mandala, like the medicine wheel, provides a framework for me to weave together both religious themes and images associated with the four seasons, the four elements (earth, fire, air, and water), and the four cardinal directions as a way of connecting the viewer to the sacred that is available to us in the everyday. This reverence for the earth—or Pachamama as she is known in South America—was reinforced again for me during a pilgrimage to Peru in 2006 where I was introduced to the ancient spiritual teachings of the Andes, which inspired three paintings in this show. It has been said that in order to counter the ecological crisis we need an aesthetic revolution. My work is a contribution to this endeavor. I haven’t posted here in over a month. Hard to believe that much time has passed but we must surrender when the muse takes over and a deadline emerges! A synchronicity occurred where I was given the opportunity to show my paintings during the month of September, so the world dropped away as I immersed myself in the universal flow of creative energy in order to finish two large paintings. One of these is “The Annunciation.” shown here. It’s large, 4 x 4′ so she is so more beautiful and luminous in person, if you get the opportunity. The Archangel Gabriel appears throughout the sacred texts in the Abrahamic tradition. To announce the birth of St. John the Baptist to Zechariah; to announce the birth of Christ to the Virgin Mary; and finally, appearing to the Prophet Mohammed to reveal the Quran in the Islamic tradition. All these announced the birth of a new era in history. 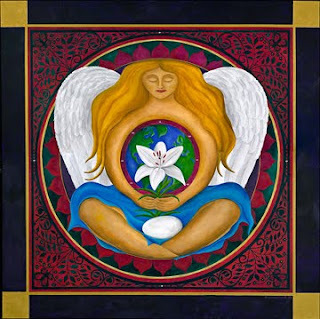 Here, I take this theme of annunciation to symbolize the birth of an emerging consciousness that is occurring around the globe, which is grounded in the recognition of our innate interconnectedness in the web of creation. The angel is depicted as female, or Gabriella, representative of the sacred feminine. 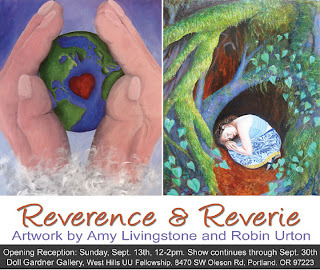 Synchronicity brought Robin Urton and Amy Livingstone together, leading to an awareness of a shared artistic vision rooted in reverence for the earth. Drawing inspiration from a combination of personal reverie, sacred mythologies, and the world’s spiritual traditions, this exhibit reflects the sensibility of creating art as a sacred act. The intention of the work is to awaken hearts to beauty and the divine presence woven throughout the fabric of everyday life. During my days and nights in the sanctuary of my studio, I thought a lot about prayer as my work is a form of meditation imbued with a sacred intention and an intense focus which I bring to the process–much like that of Tibetan monks who create elaborate sand mandalas. Part of this inquiry was prompted by my listening to a podcast with Krista Tippett on Speaking of Faith. In the past, prayer always entailed bargaining with an invisible omnipotent God and for nearly two decades, I had a strong aversion to the word itself. Twenty years ago, I prayed to God to save my brother who was diagnosed with AIDS. My prayers went unanswered and my brother died two years later. Being a lapsed Protestant, I figured why would “He” answer my prayers? When my mother died nine months later, I decided then there was no God otherwise how could God allow so much suffering. I was young at the time and didn’t have the wisdom to understand that suffering is a part of life, too. It wasn’t until I discovered Buddhism in the wake of these losses that I found some comfort around this truth. This didn’t prevent me from grieving for a very long period but those where also transformative years. Deep reflection and questioning of life’s greater mysteries. Why am I here? What is my purpose? What is the meaning of life? It was the beginning of my spiritual awakening and a shift in perspective that continues to inform my life. What I have discovered and what the Speaking of Faith guests also affirmed for me was that prayer doesn’t necessarily have to be tied to a deity. Of course, it can be if that is part of a religious tradition such as Judaism, Christianity, Hinduism, etc. I find it beautiful that in Islam, Muslims stop what they are doing, turn towards Mecca, and pray to Allah (God) five times a day. For me, there is a deep sense of reverence imbued into everyday life in this practice. This is similar to the indigenous peoples of Peru, who ask permission and make an offering to the Apus (mountain spirits) or Pachamama (Mother Earth) before any endeavor to show reverence and respect. So I have reclaimed the word prayer for myself through the sacred act of creating art. Silence, stillness, contemplation, the paintbrush gliding along the canvas, gratitude for the gift that has been bestowed upon me in this life. All acts of prayer, praise. My offering to the healing of our hearts and our world. Our world is moving so fast and I do strongly believe that one of the most radical things we can do is to simply slow down. To be more present to life, to each other, and to the natural world. Awaken to beauty, the sacred. We don’t need to wait until we lose someone we love or face an illness to have a shift in perspective, we can choose gratitude—right here, right now. Caroline Myss has a wonderful video clip on this. Living in Gratitude. Reverence. Gratitude. Praise. Prayer. Art as prayer. May all beings know peace. Aho.